Did you know that SOL Connect not only offer an ongoing yearly support package, it also offers short term remote support packages? We can provide a SOL Connect Hub, remote support and in certain circumstance a responder for a fixed period of time. 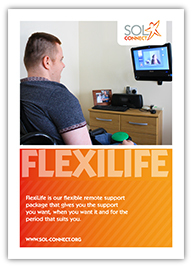 Click here to find out more about FlexiLife and to find out the difference it made to Olivia and her parents. If you would like more information about FlexiLife please get in touch with us.